Toyota's Tacoma remains the top-selling midsized truck in America. Here are the simple reasons why the Tacoma continues its strong sales rate. This quarter the Ford Ranger arrived in America after an absence that can almost be described as criminal negligence by the Ford Motor Company. GM has had ample time over the past five years to build as much midsize truck capacity as it wishes to possess. Yet, the Tacoma is still selling out. Every single month. Here's why. 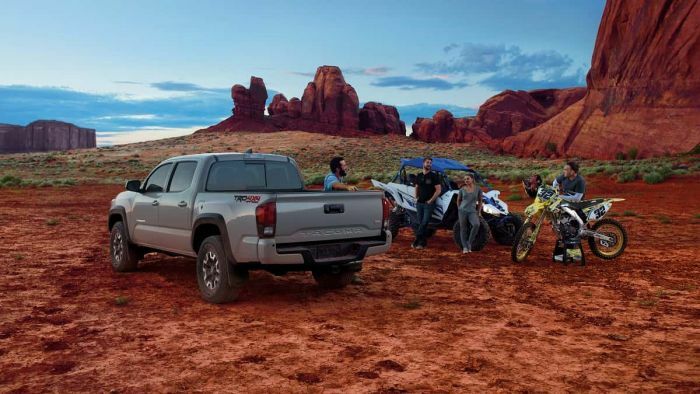 Tacoma sales are at an all-time high because the market is not yet fully satisfied. There are more truck buyers than there are trucks to buy. Toyota recognized this would be the case decades ago and planned to have truck lines that satisfied that need. Dodge, Ram, Ford, GM, and others did not. All three of what used to be called "the big three" automakers selfishly opted to only make full-sized trucks for a while and took a nap. Toyota kept at it. Very simple business plan if you think about it. The second reason Toyota's Tacoma is still the top-selling midsized truck in America because the Tacoma earned a loyal following over decades of excellence. The Tacoma is so good it has had the top resale valuation of any vehicle for years. Every once in a while another Toyota like the FJ Cruiser will challenge it, or maybe the Jeep Wrangler. Also the best in its class for decades. This builds a base of loyal customers and fans. Quit on a model for a while and your base tends to go elsewhere. Toyota never quit on smaller than full-size trucks. Every other automaker (except Nissan) did. One thing EV fanatics never seem to understand is that a vehicle cannot possibly outsell its production capacity. That is just as true for trucks. It sounds simple, but many models fans wish would sell more robustly or be more readily available are simply not able to be produced in greater numbers. Toyota has the North American production capacity to build all the trucks it wishes to sell. That number happens to be larger than the capacity that GM has. Ford, GM, Jeep could challenge Toyota's top position in sales, but they would have to build capacity. And hire UAW workers. Those are jobs for life and the domestic auto manufacturers will never risk having any UAW plant building cars or trucks that it cannot sell. So they hedge their bets. In the first quarter of 2019, Toyota sold 58,183 Tacomas. Up about 9% over Q1 last year. Chevrolet sold 33,494 Colorados. GMC sold 6,954 Canyons. In its first quarter of the new generation truck, Ford Sold 9,421 Rangers. In the coming quarters, Jeep's Gladiator will arrive. Ford's production will ramp to its full capacity. And Toyota will very likely still remain the top-selling midsized truck in America. Now you know why. What Went Wrong With Scion FR-S, Subaru BRZ Recall? What Accessories Make The 2019 Toyota Tundra TRD Pro Special? Toyota Pours Resources and Jobs Into Expanding U.S. Manufacturing - Is Your State On The List?